Beautiful Steve. It’s almost a totally different flower from this perspective. It is indeed different from this perspective. I’m glad I took the time and trouble to lie on the ground, which I had to do to get a picture of such a low flower. I think you’re right that those are sepals. Not until I took pictures a week ago did I realize how appealing a feature of this species its sepals can be. Even more decorative, viewed from that unusual angle. I had to “decorate” the ground with my body to get that unusual angle. It was worth it. The difference between the images is remarkable. In the earlier photo, both the flowers and the leaves seem so stiff and thick: almost as though they were cut out from construction paper, or done in clay. In this one, I especially like the translucency of the sepals. Seeing light shining through petals or leaves is fairly common, but I don’t remember seeing an entire flower glowing like this. I just looked back at the comments on the 2012 post and was reminded of how you’d come across a mention of the Pavonia station on the PATH subway line in New Jersey. I replied that I had a personal experience with that station from 1967, when I regularly came up from underground at night and emerged into a surreal industrial wasteland. That was decades before I knew there was such a thing as a pavonia flower. As much as I like pavonia mallow from the front or side (which emphasizes the stamen column), I’ll agree with you that the translucent rear view is something extra-special. I have not been good at marking my footprint here, but I do visit frequently and always enjoy what I see. The tininess and industry of the ant here led me to search out quotations about ants. Here’s one I particularly liked: An ant on the move does more than a dozing ox. It’s good of you to focus on the ant and to follow up by seeking out a related quotation. The one you cited strikes me as similar to the fable of the tortoise and the hare. Consider your footprint well marked. Nice Steve! I really like the perspective from behind! You’ve probably found in your photography, too, that the perspective from behind can be better than the one from the front. Lovely image and colours Steve .. is that an insect that I can see? Yes, it’s an ant. I mentioned it in the title but then never said anything about it in the post’s text. I find ants on lots of flowers. Silly me .. missed ant in your headline! Ah, yes, you just caught it. The ant moved around a lot and I didn’t always catch it in a good position when I photographed the flower. In this image I did. Oh I really like this ant’s view shot. 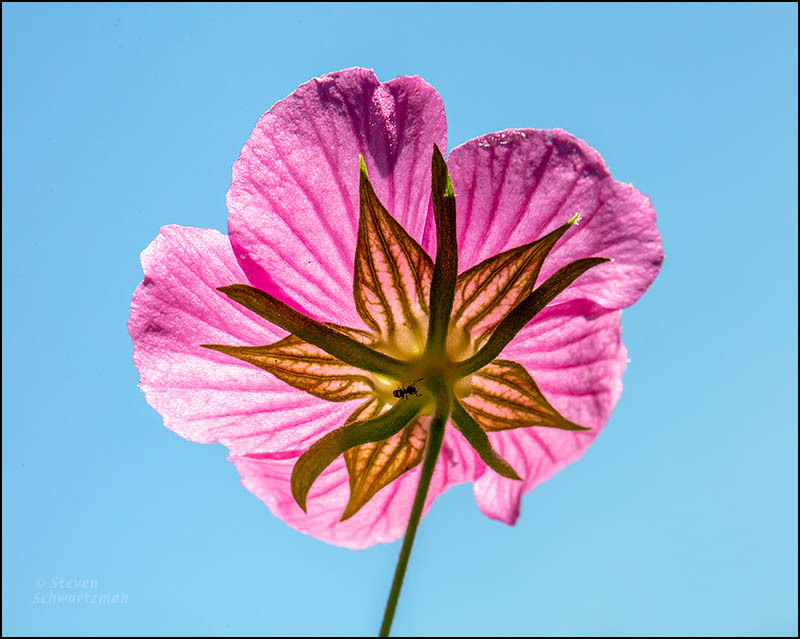 It is a real pleasure to look at a flower from an unusual perspective. Just change my first name to Unusual and my last to Perspective. You’ll remember that I carry a mat around to cushion my frequent contacts with the ground to get a non-traditional view of things. Oh yes, I remember. There are many plants that benefit from the treatment. I’ve been surprised at the number of flowers that are determinedly down-turned. And there’s been no down-turn in the frequency of my photographing down-turned flowers.